Obscured skies and snowing moderately throughout the day, moderate NW winds off the ridge line, strong NW winds on the ridge line, moving snow into the Monitors. There was about a foot of new snow at 9000ft and up. 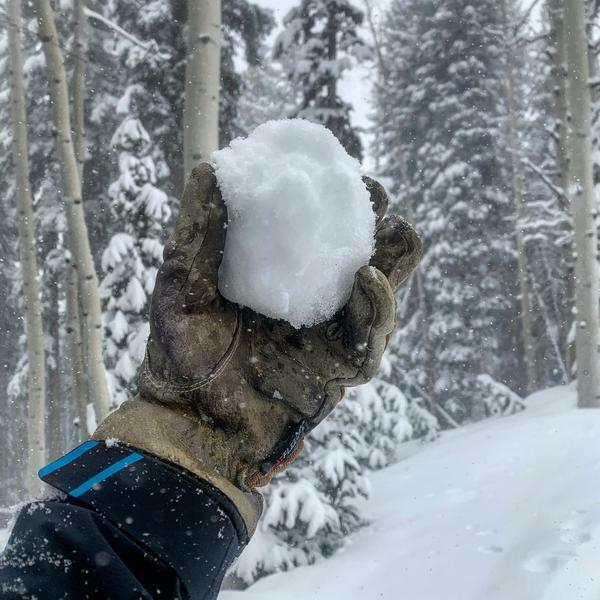 The new snow was light density with a bit of a density inversion 4 inches down, denser on top of lighter, you could feel it while hiking but not while skiing. I’m thinking the surface was denser due to a combination of wind and warmer daytime temperatures. Went up W Willow to the PC Ridgeline from Solitude, it was obvious that the damp snow under the new still remained saturated and damp. 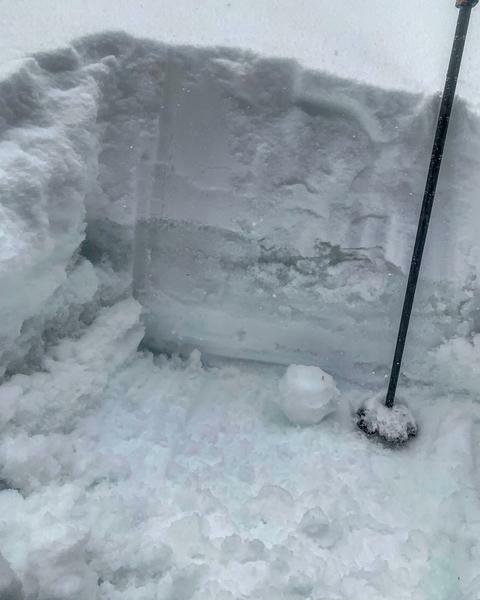 A quick pit at about 9000ft revealed a foot of new snow with a density inversion 4 inches down resting on 3 to 4 inches of completely saturated wet grains, then moderately damp snow below that. It seemed like it might have rained on the already damp surface snow before it turned to snow. We were getting loud and large collapses from the new snow collapsing on the wet grains also cracking. 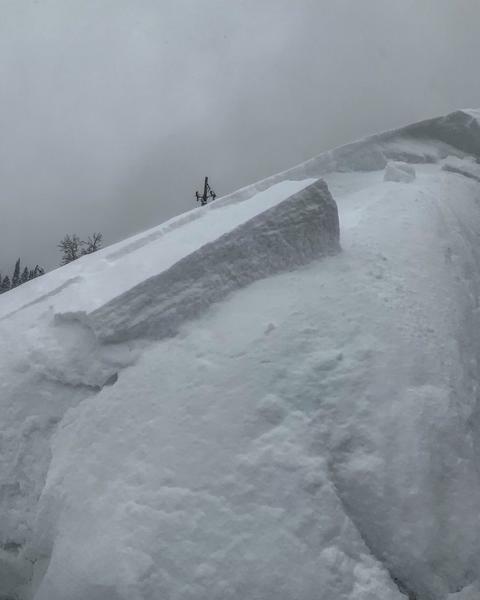 There was a thin barely frozen crust at the new snow old snow interface which I think made the collapses more connected. 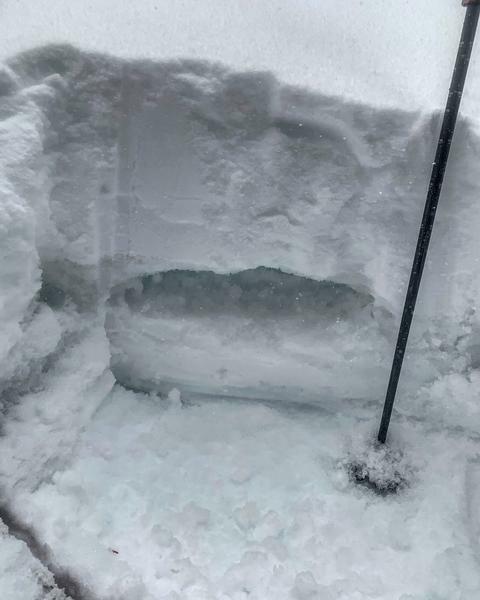 You could literally squeeze water out of the wet grains and it might take some time for this layer to freeze and seize up due to it being insulated by the new foot of snow. Never had enough visibility to see what was going on in the Monitors but the collapsing and cracking was enough to keep us out of them. Hazard depends on wind, snow amounts and temperatures tomorrow, if the sun comes out I’d say considerable, if it stays cold and cloudy with decreasing wind speeds I go with moderate. I would think the density inversion would settle out rapidly, I’d be more worried about the wet grains under the new snow and the new snow heating up.